Hanstel again, and some intrigue! Well it does look like Gretel tried to do something to distract herself while waiting, but it also seems that her brother wasn’t pleased. Still, it makes me wonder if Hanstel meant Velvy and his abilities and maybe find a way to temporarily neutralize it. Maybe they can help Velvy ? Maybe Dr. Muffet figured something out to help Velvy ? I curious as of what Hansel thinks of Dr. Muffett and his genius ? I also wonder who the final member of this team is ? I find it interesting that Hanstel considers, at least in part, Gretel and himself to be the same person. 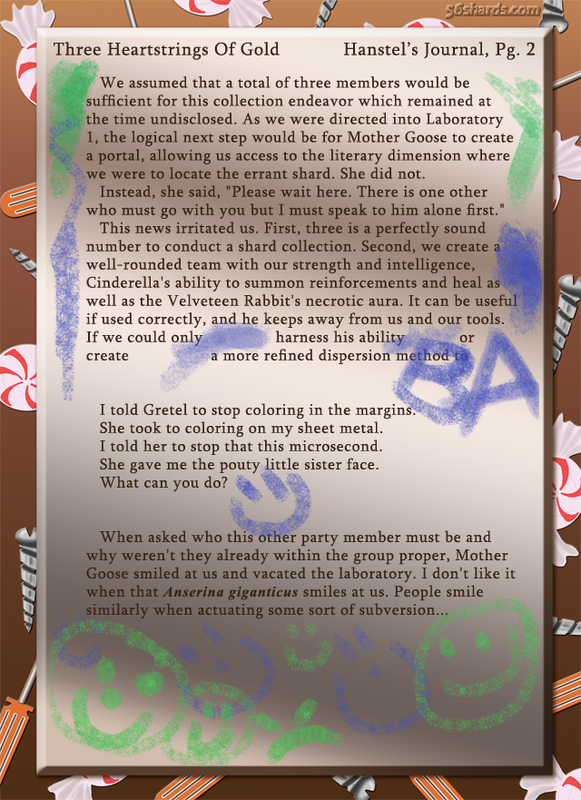 Also, Gretel draws smiley faces, and letters. And seems to know how to get her way, at least a little. Gretel can draw about as good as a 4- or 5-year-old, which is kinda above her mental capacity, but sometimes I think she feeds off Hansel’s smarts.